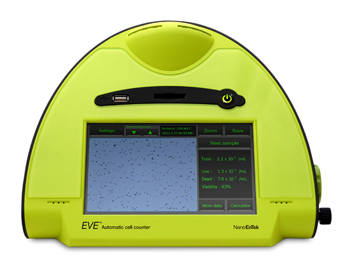 EVE TM Automated cell counter, with state-of-the-art optics provides image analysis for cell counting . The EVETM is a bench top size counter, designed to measure live, dead, and total counting, which gives us capability for viability with accuracy and precision. The EVE™ uses state-of-the-art optics and image analysis to automate cell counting. It is a benchtop counter, designed to measure cell count and viability (live, dead, and total cells) accurately and precisely, using the standard trypan blue technique.